First you have to ask the bride and groom for their wedding rings so you can make a close up photo in a distinct background. Then you have to ask them if they don't mind the rings getting wet. When the answer to both questions is yes, you are given the opportunity to place their wedding rings in a champagne class and try to create a distinct image. Once you have the rings, you know have to figure out an arrangement that displays all three and yet features the larger engagement ring. Sometimes a perfect setup just falls into place in the glass, but most times it's just a system of trial and error. Then once you have the rings ready to go, it's time to add the champagne. 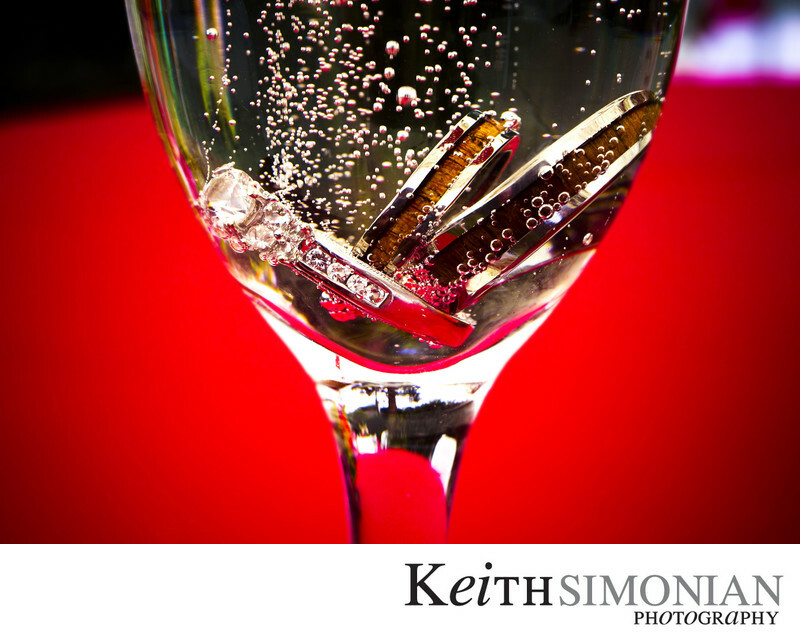 You just want enough to fill the frame of the photo, not to fill the glass because the bubbles will slow down over time, and you will need to add more champagne to get more bubbles. This photo was made on a Canon 5D Mark 3 and a Sigma 50mm macro lens. The red tablecloth which I was able to place behind the glass made for a distinctive background. Location: The Lakes at El Segundo 400 S Sepulveda Blvd El Segundo, CA 90245. 1/320; f/13.0; ISO 500; 50.0 mm.